Miller Maxstar® 161 S with X-CASE is a 160 amp stick welder that weighs only 13 pounds and operates on either 120 volt or 240 input power. The Maxstar 161 S offers superior stick arc performance, even when using E6010. It features a digital meter that monitors welding amps and also has Miller's Auto-Line™ that automatically adjusts for input voltages ranging from 120 volts to 240 volts without manual linking. The Maxstar 161 S comes complete with the X-CASE transportaion and storage case and features Miller's True Blue® 3 year warranty. X-CASE transportation and storage case protects your Maxstar 161 S in the shop, in the truck or on the job site. PLUS get a $100 Build With Blue™ Cash Rebate from Miller® with the purchase of a Maxstar® 161 welder AND get up to an additional $200 Cash Rebate when you purchase qualifying Miller® or Hobart® branded accessories (excludes welders and plasma cutters). 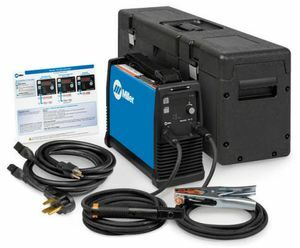 No, the Miller Maxstar 161 S Stick Welder w/X-CASE 907709001 is a DC only welder so you cannot weld aluminum. I gave this review 5 stars for a few reasons, first the machine does burn 6010 really well ,even on 120 volts.Now it is not a big bad pipe welding machine,but for repair work it is the ticket. I have run it about 10 hours of welding time, building tank frames. Runs 7018s very well. Used 6010s just to see what it could do, does fine with them. The cooling fan comes on right away, doesnt seem to be a problem. Overall this is a very good repair/small fab type machine. The first machine I received would not power up the output, Bonnie at Cyberweld and Boone at Miller couldn't have been more helpful ,machine was replaced ASAP. That is another reason for the 5 star review, great service and great people to deal with and a nice little machine. Thanks,B.G. ConsNothing really,Priced higher than others,but also better quality than others. I really enjoy using the 161s. I do part time work for an organization that has been using several of Millers 150s machines for several years now. We weld literally tons of 1/4 and 3/8 inch steel together for our projects. We operate the 150s machines with Generac 8 KW generators in very remote locations. We can weld with 1/8 inch 6011 all day long. Many times we weld for long periods of time just as fast as we can burn a rod and replace it with a fresh one. The 150s machines never fail, and are tough as nails. I decided I wanted one for my own personal use. But when I looked, I could find almost no new 150s machines for sale on the net. So it seems to me that the 161s must have replaced the 150s machine??? Anyway I decided to order the 161s for my own personal use. So far I haven't put the 161s through the abuse our organizations 150s machines have been through. But the 161s seems to be every bit as good as the 150s machine and perhaps even better. However, see the pros and cons below. ProsLove that nice digital amperage readout. The amperage dial with the detents is much better than the one on the150s machine. (But see cons) I love the way that 161s machine welds. I get good penetration and as long as one is using good rods, its hard to accidentally stick a rod. Very easy to get the arc going and maintain it. Even a beginner can strike and keep an arc with this machine. That is also true with the 150 s machine. ConsThe amperage setting dial (as I said above) is an improvement over the 150s machine, but it is still VERY EASY to accidentally knock it off the desired setting when the machine is moved. But this is probably not that important since the 161s machine seems to have the ability to self adjust the amperage to what is needed for the job.??? The two separate power cords (120 and 240 volts) and the place they plug in on the back of the machine seem like weak points to me. I'm afraid they will eventually fail, either through wear and tear, or from an impact. The organization I work with uses these 150s machines in very challenging and remote locations. Sometimes power cords get yanked around. I don't anticipate using my machine in such difficult situations, but accidents can happen. The plug in on the back of the 161s machine seems weak to me. Also the Rod holder (stinger) has an extremely strong spring. I'm not sure my grip strength would hold up to an all day welding project. I will probably replace the stinger with another one which is easier for me to use.